Enjoy the soothing and healing benefits of heat therapy with the InfraMat™ FullMat-11JT. A full-body heating pad from HealthyLine™, this mat is made with 350 jade and 350 tourmaline stones that each measure one inch. 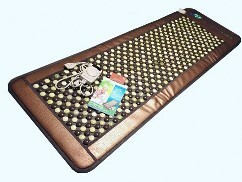 Boasting construction of the highest quality, this mat uses advanced Far Infrared Rays (FIR) and features unique properties that benefit the body in numerous ways. Both jade and tourmaline produce negative ions, molecules known to have a positive and recuperative effect on the body’s cells. They have no taste, color, scent, or visible attributes, but the negative ion molecules can treat a variety of ailments and conditions. Negative ions can also boost a person’s energy levels and provide several other benefits. Jade and tourmaline, the two types of stone tiles used in this full-body mat, have individual characteristics that promote healing. The benefits come from heat penetration and the molecular properties of the stones. The combination of the two stones addresses a wide number of health concerns and sources of discomfort. Jade is recognized worldwide for its distinctive physical traits. In China, jade has been renowned for over 2,000 years for its healing properties. The heat transfer characteristics of jade and its chemical composition provide a number of specific health benefits. Rare and unique, tourmaline also offers many health benefits. A boron silicate mineral with a complex chemical structure, tourmaline is commonly mined in small Chinese villages. The process of constructing the tourmaline tiles enhances the effectiveness of the negative ions, improving the benefits even further. In addition to the molecular attributes of the jade and tourmaline stones, the heated stones aid in healing in other ways. The heat penetration achieved effectively reaches areas of the body that are in discomfort or experiencing stress. Improved blood and oxygen circulation aids in healing and reducing pain. Muscle pain, back pain, and spasms might all be eased with the help of the InfraMat™ FullMat-11JT. Many conditions and health issues can lead to the need for heat therapy and pain relief. Both injury and illness can create agitation, aches, and tenderness. Some issues are chronic, but relief is found with the comforting effects of the InfraMat™ FullMat-11JT. There are several conditions in particular that can be soothed with the mat’s FIR technology. When the body experiences pain relief, improved flexibility and a healthier outlook often follow. With the sensations of relaxation and pain relief, the mat also brings about a greater feeling of well-being. The mat’s LED controller provides easy operation. Order now to begin experiencing tranquility and whole-body healing.